"Assuming that I was sane and awake, my experience on that night was such as has befallen no man before. It was, moreover, a frightful confirmation of all I had sought to dismiss as myth and dream." Fantasy Flight Games is proud to announce the upcoming release of Arkham Horror: The Card Game, the Living Card Game® of Lovecraftian mystery, monsters, and madness! You and your friends become characters within the quiet New England town of Arkham. You have your talents, sure, but you also have your flaws. Perhaps you've dabbled a little too much in the writings of the Necronomicon, and its words continue to haunt you. Perhaps you feel compelled to cover up any signs of otherworldly evils, hampering your own investigations in order to protect the quiet confidence of the greater population. Perhaps you'll be scarred by your encounters with a ghoulish cult. 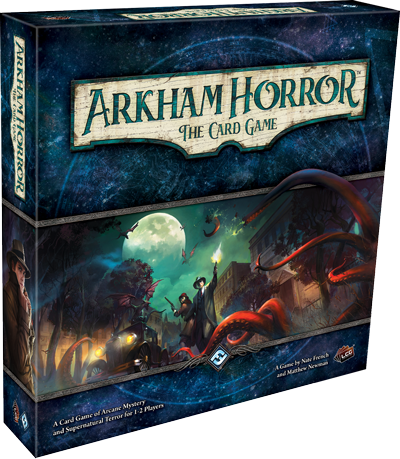 Arkham Horror: The Card Game, more than any card game before it, is a blend of the traditional customizable card game and roleplaying experiences. You become one of the game's investigators and customize your deck of cards to reflect your personal strengths and resources. 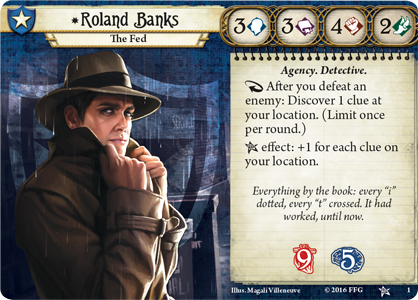 However, as the investigators of Arkham LCG all have their own distinct personalities, each comes with his or her own deckbuilding requirements. 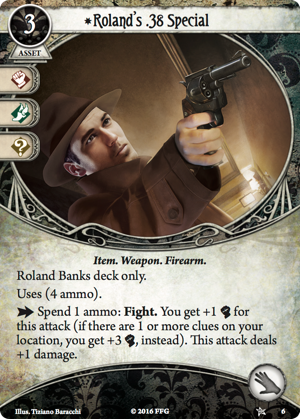 For example, when you conduct your investigations of Arkham as the Federal Agent Roland Banks (Core Set, 1), your deck must include the cards Roland's .38 Special (Core Set, 6) and Cover Up (Core Set, 7), along with one basic weakness, such as Paranoia (Core Set, 97) or Amnesia (Core Set, 96). These character-specific cards, then, are part of who Roland actually becomes throughout the course of your adventures, and they don't count against your basic deck size. The rest of your deck is made up of cards that belong to the different classes available to your character. Again, using Roland as our example, he can use cards that belong to either the Guardian or Seeker classes, as well as Neutral cards. 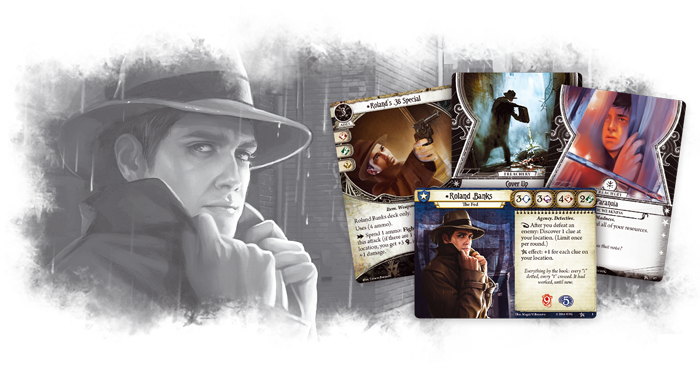 Altogether, there are five different classes in Arkham LCG, one corresponding primarily to each of the five different investigators in the Core Set, and each encourages a remarkably different approach to your investigations. Perhaps most important, though, is the measure of freedom you're given to decide how you'll use the different resources at your disposal. Explore locations, battle monsters, search for the right equipment, or race across the city—you're free to pursue whatever course of action seems best to you at the moment. Your actions aren't determined by the cards in your hand; instead, you'll find opportunities to make use of your cards, according to the actions you wish to take. You have three actions each round, and in the best of all roleplaying traditions, it's what you do when it's your turn to act that determines whether you will escape from a ravenous pack of ghouls, unmask a cult devoted to the Ancient Ones, or go mad. Your choices determine the shape of your adventures! It is easy to enjoy Arkham LCG as a series of standalone adventures. 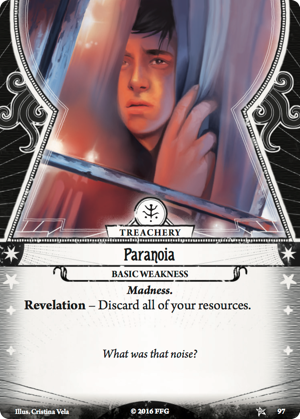 However, as much as all of your adventures thrust you into the midst of thrilling and horrifying situations, it is only when you see how they follow upon each other that you truly begin to understand the madness at the edges of Arkham LCG… The basic mode of play is not the adventure, after all, but the campaign. And all your choices and actions have consequences that reach far beyond the immediate resolution of the scenario at hand. You might be scarred by your adventures, your sanity strained, and the onset of madness creeping in at the corners of your mind. You will make choices that determine whether or not your allies will continue working with you. You may alter Arkham's landscape, burning buildings to the ground. And you may gain valuable experience with which you can better prepare yourself for the adventures that still lie before you. 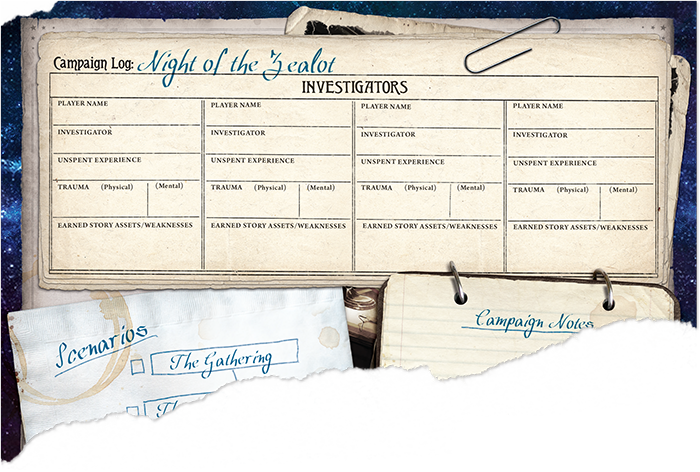 The Core Set comes with three adventures that link together in the Night of the Zealot campaign. Your successes or failures in the first of these adventures, The Gathering, will determine not only how you'll set up the future adventures, but they'll determine how much experience you'll be able to spend upgrading your deck. 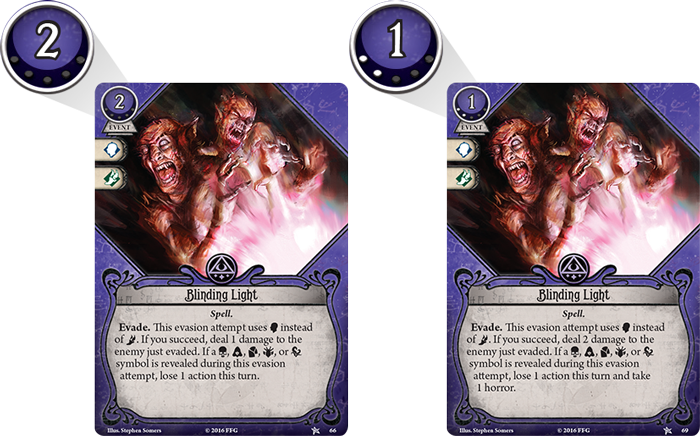 Many of the cards in Arkham LCG feature one to five pips near their costs that indicate their "level." 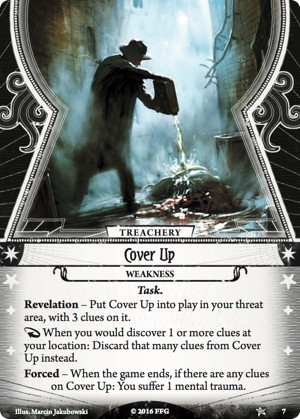 While you won't start your campaign with these cards, you can spend experience to buy them and upgrade your deck between adventures, replacing other cards and "leveling-up" your investigator. This ability to advance your character throughout a campaign is yet another way that Arkham Horror: The Card Game opens a portal between the realms of card gaming and roleplay. Because Arkham Horror: The Card Game is a Living Card Game, the Core Set is not just the beginning of your adventures, it is your gateway to new worlds, new dimensions, and a whole new level of thought and understanding. While the Core Set comes with enough cards to promote a wide variety of different decks, and its adventures will reward you with hours upon hours of fascinating and horrifying mysteries, it also sets you apart from the vast majority of humanity—all those people who blissfully and ignorantly go about their lives unaware of the other worlds that border upon ours, the Ancient Ones that inhabit those alien realms, and the foul rituals conducted on earth by those mortals who worship them. Thus set apart, your world view shifts, and you see things differently, and this seeing doesn't end with the Core Set. 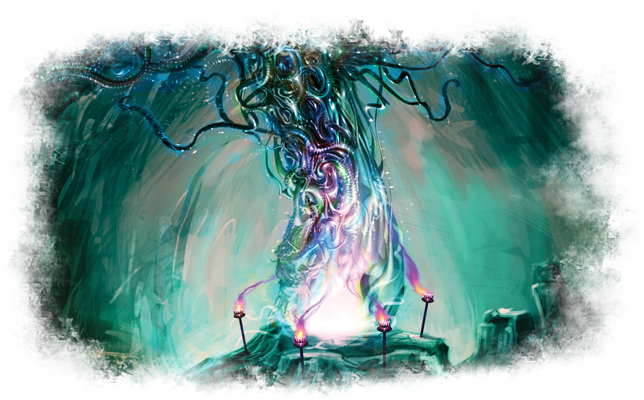 It continues with each Mythos Pack and Deluxe Expansion and the new campaigns they introduce. It continues with their adventures and player cards, and you may even run across new investigators along the way. Pursue layered mysteries within a world of Lovecraftian horror. Arkham Horror: The Card Game is scheduled for release in the fourth quarter of 2016. 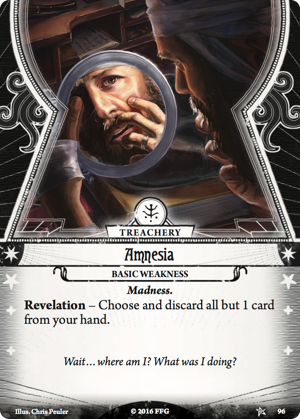 Until then, watch for our previews, and visit the Arkham Horror: The Card Game website to uncover even more clues!